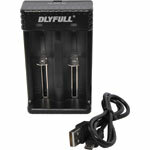 A portable USB charger suitable for lithium Ion cells. Suits 26650, 22650, 18650, 17670, 18490, 17500, 18350, 17335, 16340(RCR123), 14500, 10440. 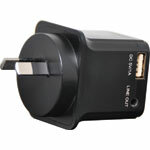 This high performance charger features a USB charger so you can reload batteries anytime, anywhere. 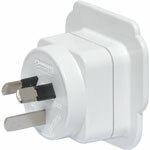 Allows appliances from all over the world to be plugged into Australian outlets. 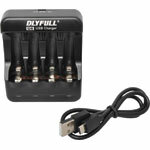 Use on almost any appliance, such as mobile phone chargers, shavers, irons or laptops. Suits appliances from most countries. 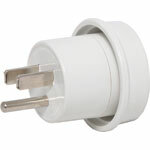 Allows Australian appliances to be plugged into international sockets. Does not convert voltage. 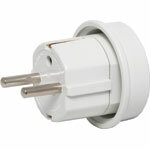 Europe to Australia adaptor. 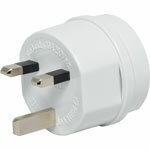 This adaptor converts 2 and 3 pin European plugs, U.S. and Japanese plugs to be used in Australia and New Zealand. 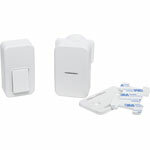 Easy wireless installation with a choice of 25 ring tones. Up to 100m call range in an open space. No batteries are ever required. 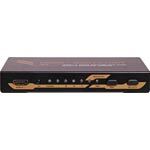 Allows you to repeat infra-red control signals over HDMI from your TV to HDMI equipped device, amplifier or receiver. 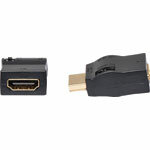 The HDMI inline dongles allow easy connection to IR target & emitter (included). 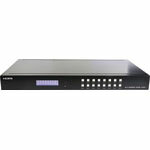 Allows you to repeat infra-red control signals from your TV to remotely located equipment. 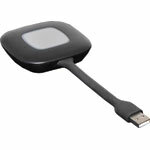 Easily powered by any USB port either on the rear of your TV, Amplifier or from a nearby wall outlet. 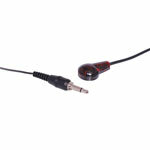 Allows easy connection to IR target & emitter (included). 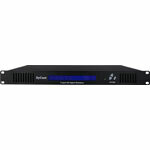 The A 1720B is an MP3 based message player and tone generator designed for public address, security, customer direction or emergency evacuation announcements. 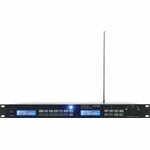 This dual tuner is ideal for multi zone audio systems requiring separate programming in each zone. This compact 1RU device contains two individual tuners utilising Phase Locked Loop (PLL) synthesised circuitry to ensure excellent frequency stability. The all-new RX-V385 model is wireless-enabled, with streaming from Bluetooth devices at the touch of a button. Movie watchers are also catered for with 4K Ultra HD as well as HDMI 2.0, BT.2020 compatibility and HDCP 2.2, HDR video. 70W RMS per channel. Four HDMI inputs. AM/FM analog tuner. Wireless-enabled, with streaming from Bluetooth devices at the touch of a button. 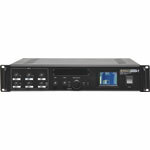 Features the latest in connectivity including popular music streaming services such as Pandora® and Spotify®. DLNA streaming. 4K Ultra HD ready with HDMI 2.0 and HDCP 2.2. 80W RMS per channel. Four HDMI inputs. AM/FM analog tuner. 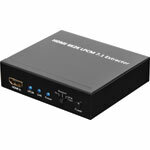 This compact 4-way HDMI switcher features manual & infra-red remote control for switching up to 4 sources to a single display supporting resolutions up to 4K. 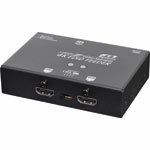 Allows the connection of a single HDMI source to multiple HDMI displays with no loss of quality. Uses include home theatre, conference centres, sports bars etc. Includes power supply. HDCP compliant. 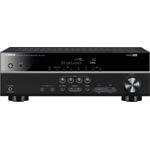 3D 4K x 2K, 12-bit deep colour and HD lossless audio support. 2 Way V2.0 18Gbps Bandwidth. 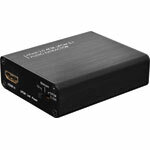 This HDMI Distribution Amplifier gives users the ability to connect any digital video source such as DVDs, satellites, cable boxes, and more with up to 16 digital HDMI displays. 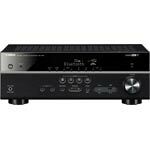 The Amplifier splits HDMI signals without signal loss to maintain high resolutions. 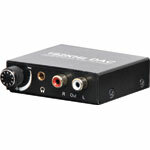 This device is designed to receive two channels audio signal from the Dante network, and converts to analogue RCA outputs. 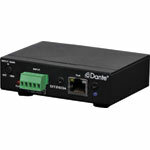 Simply use Cat5 cable to connect the RJ45 port to an Ethernet switch, and using Dante controller to receive the low latency of signal from other devices which already connected on the same Dante network. 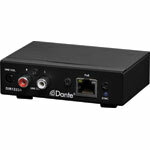 This device is designed to provide two channels audio signal to the Dante network by the Euro terminal input. 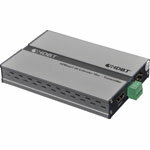 Simply use Cat5 cable to connect the RJ45 port to an Ethernet switch, and using Dante controller to route the low latency of signal to other devices which already connected on the same Dante network. 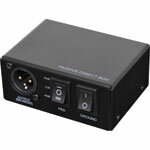 This converter is designed for professional audio signal processing.It can easily convert Coaxial or Toslink interface to RCA analog audio interface and 3.5mm headphone jack. With its professional audio amplifier chip and volume adjusting switch you have the ability to drive your headphones directly and are able to adjust the output volume. 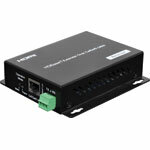 Utilises the latest HDBaseT technology to send full HD uncompressed HDMI signals over Cat 5e/6 cable. 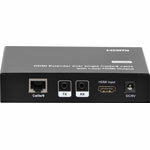 Allows 1080p HDMI signals to be extended up to 100m from their source over a single Cat5e/6 cable, whilst retaining full high definition quality. 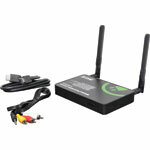 Built in IR extender allows remote control of source devices. 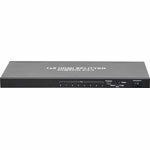 This 4K 4x4 HDMI 2.0 Matrix Router with HDR 4K@60hz YUV4:4:4 @ 18Gbps routes high definition video sources plus multi-channel (up to 7.1-channel) digital audio from any of the four HDMI sources to the 4-displays at the same time or any of the 256 combinations. This 4K 8x8 HDMI Matrix Router is a fixed 4K 8x8 HDMI Matrix Router with EDID management to work with HDMI sources and HDMI displays. 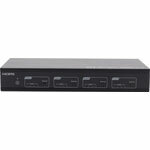 It supports 8 HDMI inputs and 8 HDMI outputs and every HDMI input and output supports 1080p Full HD and 4K plus all 3D formats and independent EDID management. 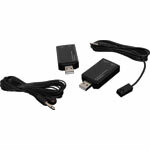 This wireless presentation kit features two USB-buttons and allows users to share content from their laptops or mobile devices on a large meeting room screen in a very simple way- without cables and additional configuration, just by clicking the button of the USB-button connected to a laptop,or using the app for iPhone or Android.. This spare dongle suits A 3455 which is a wireless presentation kit which allows users to share content from their laptops or mobile devices on a large meeting room screen in a very simple way- without cables and additional configuration, just by clicking the button of the USB-button connected to a laptop,or using the app for iPhone or Android. 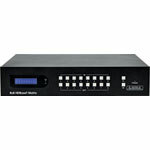 Cat6 balun receivers are sold individually, each includes IR receiver, IR transmitter and power supply. Size: 482W x 250D x 44Hmm. 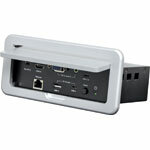 Connects HDMI AV devices independently and switches each to HDMI equipped displays using the latest HDBaseT technology. 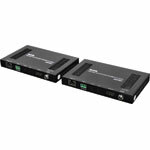 HDBaseT allows these units to send full uncompressed audio and video over a single Cat6/7 UTP cable to the A 3528A balun receivers located in another room up to 70m away (40m @ 4K/60Hz). 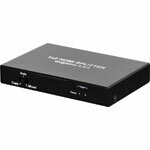 Allows you to split the audio stream from a HDMI signal into either S/PDIF optical or four analog stereo 3.5mm jack outputs - ideal for 7.1 multi-channel systems. 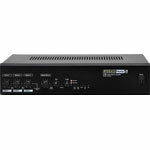 With the help of this audio extractor you can extract audio signals from any HMDI compliant source to digital optical or analog stereo audio outputs. 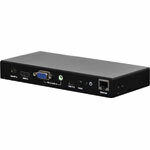 Ideal for use in educational or boardroom environments, this handy converter box provides connection for devices with VGA/3.5mm audio, USB-C, Mini DisplayPort and HDMI connections and outputs to a HDMI equipped projector or display. Designed to meet the requirements of medium sized professional public address installations, delivering an output power of 40W RMS respectively. Designed to meet the requirements of medium sized professional public address installations, delivering an output power of 100W RMS respectively. 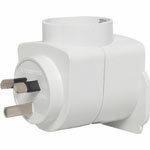 Designed in conjunction with Australias leading PA professionals to cater for the needs of multi-source installations. This redesigned unit offers the ability to monitor amplifier status via the colour LCD screen, plus custom labelling of inputs. 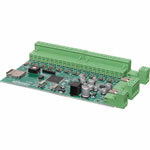 The A 2711 optional USB & SD card module provides music playback when fitted. Consists of 2 x 125 Watt amplifiers in a single chassis. 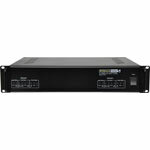 Ideal for multi-zone 100V PA requirements. Manufactured in Australia to stringent engineering criteria, the Phase 5 amplifier series exhibit quite remarkable performance and outstanding reliability.